In this business there is no greater buying opportunity than at a bear market bottom. For those few investors able to control emotions, delay gratification, and go against the crowd, a bear market bottom is where millionaires and billionaires are made. Unfortunately for the vast majority of traders, emotions are much stronger than logic. When most people observe a market that has gone up continuously for five years, they automatically assume that this market will continue to rise. And because everyone else is getting rich and they don't want to be left out, they jump on board too. In reality a market that has gone up for five years is all that much closer to a top and the upside potential is limited, not exponential. Unfortunately at market tops traders are unable to think logically and all they know is that the money is coming easy. Unfortunately when something is easy, it's usually about over. By the same token when a market has gone down dramatically for two years dumb money investors automatically assume that it will continue to fall for the foreseeable future. Let's face it, why would anyone want to buy something that is going down when you can buy stocks that are going up forever, and get rich quick? (This is the same mentality that was prevalent in the real estate market in 2005/06). Again if one would stop and think logically, a market that has gone down for two years is all that much closer to a bottom. This is how smart money investors think, they think logically instead of emotionally. 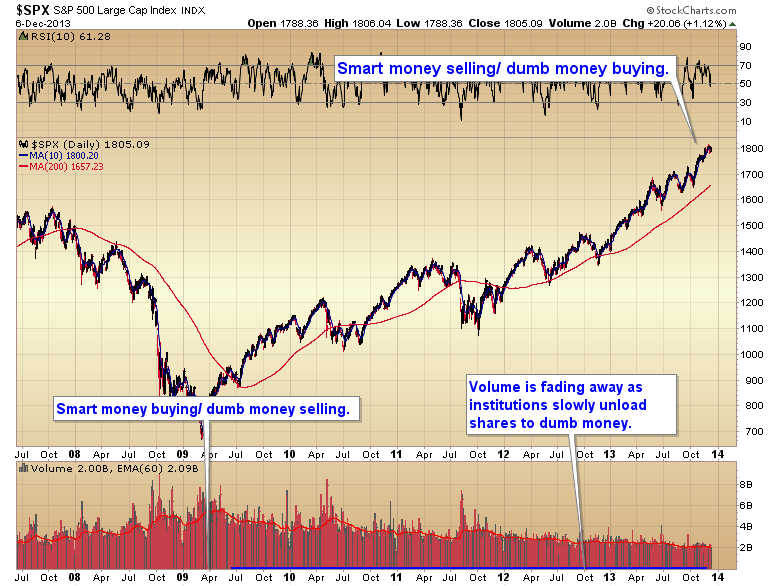 In the S&P 500 chart below, notice how the volume exploded at the 2009 low. This is a classic example of dumb money emotional selling, and smart money contrarian buying. Now after five years we have the exact opposite. Big money is slowly selling into the rally to the emotional dumb money investors. Volume is contracting.